People with thriving colonies of beneficial bacteria in their intestinal environment are better prepared to fight the overgrowth of harmful microorganisms. When beneficial bacteria are introduced they compete with yeast and harmful bacteria for attachment points along the digestive tract. The good bacteria essentially crowd out the bad guys and allow normal intestinal balance to be restored. Plusbiotic AMD contains 13.6 Billion CFUs (Colony Forming Units) of various non-competing strains of beneficial bacteria. One of these, Bacillus subtilis, is a spore-forming bacteria which helps to crowd out the yeast cells. Spore technology is a reliable way of delivering healthy microflora to the intestine. This is because the spores are very stable and able to tolerate a wider range of variables of pH and temperature, unlike most probiotics. This increases the chances that the friendly bacteria will properly germinate and start the process of restoring intestinal balance. Plusbiotic also contains isomalto-oligosaccharides (IMO), a natural, certified organic prebiotic fibre which supports human digestive health. IMO is non-GMO, sugar-free and gluten-free. This fibre is completely resistant to human digestion so it passes safely through the stomach into the intestine where it stimulates the growth of good bacteria by fermentation and creates a perfect environment for microflora colonization. Plusbiotic also contains systemic enzymes (also known as protein digesting enzymes) which help to breakdown the protective protein coating around yeasts and begin to digest their cellular infrastructure. These enzymes also help with the removal of dead yeast and other bad bacteria from the body. In turn this helps to protect the body from experiencing detox or die-off symptoms caused by the toxins released by the dying yeast cells. 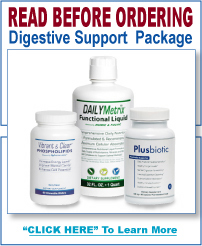 Prebiotics are soluble fibers that stimulate the growth and activity of beneficial flora. * Plusbiotic contains Isomalto-oligosaccharide or (IMO). IMO is a certified organic prebiotic fiber which is completely resistant to bodily digestion. IMO is able to pass safely through the stomach and into the intestine where it creates an ideal environment for the growth of probiotics. Most prebiotics can cause gas and bloating; however, IMO has been shown to cause the least amount of uncomfortable symptoms in comparison to other prebiotics such as inulin and FOS.